I am the definition of an Apple Fanboy. I admit it…and it is also why I do not review computer components because it is hard for me to be unbiased. This stems back to the black and white Mac Classic and System 6 days and there is no cure. After dozens of Apple computers and even more accessories…I have come to accept my sickness. I love that I can pull out my Nikon D300s with the 80-200mm/f2.8 Nikkor lens in the middle of the store and the employees want to geek out talking about photography and how my new i7 MacBook Pro is ripping up post processing and HD video (see…gets me getty just typing it). It’s a cool atmosphere and I am not ashamed to say I actually own Apple t-shirts. If you don’t like it…I don’t care! So…with the release of the new iPad, what do I think of the latest out of Steve Jobs and the rest of his crew? Note: This is my attempt to be objective on an product manufactured by Apple with only about an hour of use. Hang on with me as I am going on a weird ride. At first glance, the iPad looks like a really big iPhone. The form and function is very much the same with a home button the bottom, black surrounded front screen and rounded back edges. The aluminum rear enclosure feels much like my MacBook Pros. When you turn it on, again…you are faced with what looks like a huge iPhone. The icons for the apps are laid out exactly the same just much farther apart. The touch screen operates the same way as iPhone users are already used to…so those of you used to Apple products will be right at home. After you get past the similarities between the iPad and iPhone, that is really where the similarities stop. All of the Apple apps are redesigned to make use of the increased screen real-estate and processing power. It is almost like a mix of what I am used to seeing on my Apple computers and the iPhone. You get drop down menus, sub-menus and nice transition effects between elements. As you can see by the video below, there is no noticeable lag in application operation. The processing power of the iPad is more than enough for the apps that were installed on the test units. Even with graphics intensive gaming, the gameplay was very smooth which tells me developers are really making use of the iPads strengths. Ok Robb, We Know That…What Do You Really Think? If I was on an airplane all the time (ironic since I am typing up this article while on a flight. Thank God for exit rows), I would have one in a heartbeat. When you are in cramped spots and do most of your work online, the iPad would be worth its weight in gold. Currently, with my iPhone and MacBook Pro, I have enough portability for my needs, so I haven’t bought one…yet. What Apple basically did with the iPad is took a great idea (the Kindle from Amazon) and made it more than just a book reader. Steve Jobs and the minds at Apple created a product that extended what they created with iTunes and the iPhone. 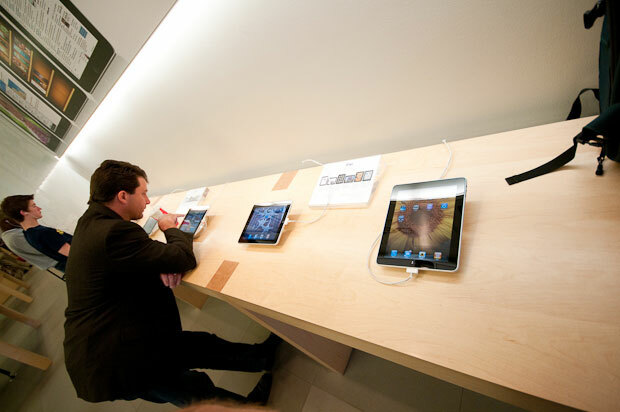 Steven Job’s ultimate goal with the iPad is to become the largest online retailer of books. And he is going to get there with the iPad. Seamless integration between hardware, software and the retail market is what Apple has done best…and the iPad is a home run in that aspect. Apple also aimed this product largely towards industrial applications like hospitals and government. Can you imagine every doctor and nurse walking around with an iPad in your office? There would be no more computers in every room and your charts, medical history would be readily accessible as if it was on a clipboard. That amount of productivity and efficiency is HUGE in those applications. Amazon has to be shaking in their boots. Apple released a better product at the same price that does more than just read a book. Not only that…but they reached an agreement with publishers that makes them more money in the end as well. The days of the Kindle owning the market are now gone. Remember when Palm had a large share of the smart phone market? Now their stock is valued at 0.00…Amazon needs to react and react quickly. Note: Of course…there is much more to Amazon’s business plan than the Kindle…so they are not going to hit up Palms fate by any stretch, but you get what I am saying. So…big surprise…I think Apple knocked it out of the park with the iPad…even if I don’t need one today. Click here to get your own Apple iPad. I told myself I wasn’t going to buy one, then I caved about a week later. 🙂 Now, I’m sitting here in Tampa Bay with literally no Ipad 3G in stock anywhere. Can’t buy one. Dammit. I actually think the Ipad is about much more than books. This is Apple’s answer to the netbook, but in the process, they’re basically saying that netbooks are crap. I see the Ipad as a computing device in a brand new class, one which serves the needs of many who don’t need full-featured OSs, with the complications that come with them. haha, you said Pwned. You sir, are not a noob. Props to you. Robb, thanks for the preview. I’d love to see how Marvel’s comic book reader app will work – I think there’s a few sneak peeks of it around the web. I’m actually talking with a dev buddy of mine, and we may release an app with my own webcomic. I’ll probably give it away as an incentive once I have my list built up and my mini course done. You know, when the iPad was first unveiled, I wasn’t too impressed. I think it had more to do with my expectations of it. I was hoping it would be a NetBook killer. Right now, its still in its first-gen phase, but I do give Apple credit – they create some wonderful tech, and the potential for the iPad is crazy huge. I won’t get this version, but you can bet I will get one once the OS becomes more advanced and able to multitask with apps. Multitasking will probably come with the iPhone 4.0 update or around that release I would imagine. I find it hard to believe they would release it for one and not the other. With the 3G functionality and the ability to use the AT&T plan only when you need it, this thing is great. No need to buy a laptop card and expensive service. The non-3G version…not so much. I actually gave up my iphone for an ipad. AT&T sent me a flip phone, and I swear it took me 10 minutes to figure out how to turn the thing on! One of my daily enjoyments has been padding off to bed with my ipad. I can lay in bed for hours and watch movies, surf the net, check my email, and then quietly fall asleep after my brain has absorbed everything it can. Then in the morning its Grab the iPad, and head on downstairs for my morning coffee and read the news and check email on the back porch, before starting work. Dinnertime I can grab my ipad and find a good recipe to cook. The iPad feels like its something personal. I went out to lunch last week and we were playing 2 person air hockey on the iPad. We got notable attention from everyone that walked by, we ended up being a big distraction at the restaurant. Maybe iPad is not ready to go out in public yet, but it sure is more convenient than shlepping my laptop around. The camera adapters for USB and SD Cards are great! At first I was upset with no camera, but now that I think about it, it may be too cumbersome to try to take photos with the iPad. Now a camera in the front for iChat would be wonderful!